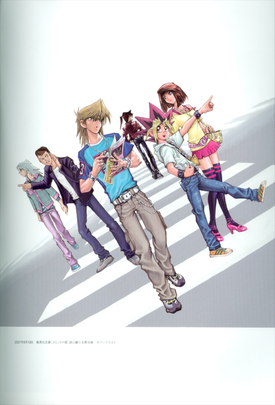 Section 5: Dungeon Dice Monsters arc, known as Section 5: D.D.D. arc (第（だい）五章（しょう）Ｄ（ディー）・Ｄ（ディー）・Ｄ（ディー）編（へん） Daigoshō Dī Dī Dī-hen) in the Japanese version, with "D.D.D." standing for "Dragons, Dice & Dungeons" (ドラゴン・ダイス・＆（アンド）ダンジョンズ Doragon Daisu ando Danjonzu), is a story arc in the Yu-Gi-Oh! manga. The new student, Ryuji Otogi faces Yugi Mutou in a game of Dungeon Dice Monsters, for the ownership of the Millennium Puzzle. This arc contains the following chapters. The "subseries number" column contains to the numbers the chapters used in their first English printing in Yu-Gi-Oh! Duelist. The Black Clown game store opened across the street from Kame Game, causing Sugoroku to worry about going out of business. Meanwhile, Ryuji Otogi has transferred to Domino High School. Ryuji plays Four Aces with Jonouchi, while Yugi suspects that the game is not as fair as it seems. The Black Crown game store releases a new game, D.D.M., which makes everybody in town line up to buy it. Yugi and his friends go to the store to check it out as well, but Yugi is lured by Mr. Clown, who seeks revenge for losing to Yugi's grandfather, and set up to play D.D.M. with his son, Ryuji, who is none other than the creator of the game. Yugi is forced to face Ryuji in a D.D.M. match. However, Ryuji holds an overwhelming advantage being the creator of the game, and immediately takes the lead against Yugi, who cannot count on his other self, without his Millennium Puzzle. Yugi is in a crisis against Ryuji. When he was about to lose hope, Ryuji reveals his reasons, reaffirming Yugi's resolve. Yugi continues to struggle against Ryuji. Ryuji seems to have completely cornered Yugi when he blocks Yugi's path, but Yugi takes advantage of Ryuji's own rare black die and turns the tables. Yugi and Ryuji are having a balanced match. Not standing seeing Sugoroku's grandson giving his son a hard time, Mr. Clown shows up and interferes, shattering Yugi's Millennium Puzzle right in front of him. Yugi breaks down seeing his Millennium Puzzle being undone by Mr. Clown, but Ryuji tells his father to stay out of it, because the match was between him and Yugi. Yugi recomposes himself in order to continue the game and obtain his Millennium Puzzle back, but Ryuji turns the tables and corners Yugi once more. At that time, Dark Bakura shows up. Yugi seems to be in a hopeless situation. Considering himself the winner already, Ryuji tries to solve the undone Millennium Puzzle, but seems not to be able to. Dark Bakura declares that no one can solve the Puzzle besides Yugi, and that he will be the winner of this game. "Battle of Zero Attack Power!!" Without losing his hope and his strong will to see his other self again, Yugi manages to pull a miraculous win using a 0 ATK creature. This page was last edited on 18 January 2019, at 21:35.